Our knowledgeable and experienced in-house program managers and engineers will be with you every step of the way. We provide full APQP, gate-style launch program management so our customers are comfortable with each stage of the part production process and confident in the quality of the final product. Hawk Plactics’ full program management includes an engineering review of new part designs for moldability and recommendations for improvement and/or cost savings where appropriate. Our program managers also facilitate tooling with exceptional local and international mold makers. Program managers are active during the manufacturing and quality control as well as the warehousing and distribution stages ensuring a continuity of exceptional customer service. 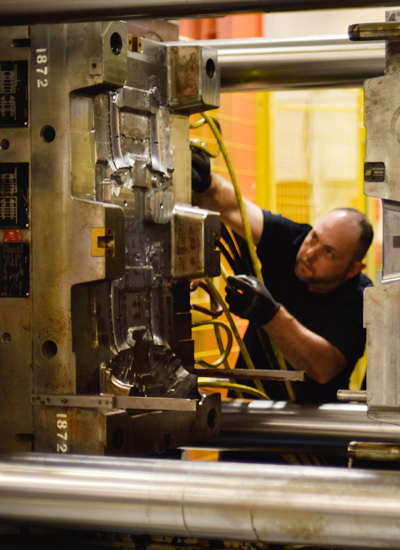 Specializing in 2-shot and insert molding, Hawk Plastics offers 32 automated presses running 24 hours a day, seven days a week in facilities spanning more than 50,000 square feet. Our presses range in size from 50 to 850 tons allowing us to produce plastic parts less than an inch in size all the way up to more than 4 feet in size. We also offer custom-built end-of-arm tooling for projects requiring special finishing tasks. Hawk provides manual part assembly with Pokeyoke detection as well as fully automated part assembly. In addition, Hawk Plastics has a full metrology department to ensure all of the products we produce are of the highest quality. Our in-house lab is staffed by specialists and equipped with a wide range of inspection equipment including a CMM, an optical comparator (shadow graph), a Spectrophotometer as well as a Mac Beth Light Booth. Hawk Plastics is strategically located near the Canada-U.S. border in Windsor, Ontario with easy access to a range of shipping methods across North America. We also have three warehouses totaling 24,000 square feet and experienced program managers who help our customers stock the right quantities in the right place at the right time.